Yuri Bashmet is a touchstone for instrumental excellence, and a musician who opened up the world of Schnittke to me through one shattering performance. His name is bracketed with the Viola Concerto, and so it seems appropriate the Schnittke should be represented in this disc, though via his Passacaglia for Orchestra. 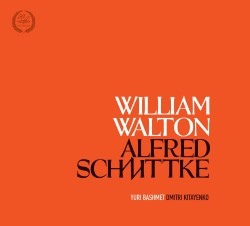 It also seems good to pair Walton with Schnittke, given that Bashmet has espoused Walton’s Viola Concerto on concert and on disc. His recording with Previn in 1994 on RCA is one that tends to get overlooked, for some reason. The disc under review is a live recording given on 6 April 1982 in the Grand Hall – didn’t Melodiya tend to call this the ‘Great’ Hall in the old days? – of the Moscow Conservatory. The Academic Symphony Orchestra of the Moscow Philharmonic Society – got there in the end – is directed by Dmitri Kitayenko. The Schnittke receives a reading of tremendous ebb and flow, as it draws in and draws out along the inexorable route of the Passacaglia. Kitayenko stresses the trenchant tidal nature of this single-span piece, and draws the listener in through some defiant cueing of the brass and percussion. This approach is very much more remorseless and unforgiving than the fleeter ones sometimes to be heard. Leif Segerstam and the Malmö Symphony, for instance (BIS-CD-437), take a full three minutes off Kitayenko’s timing. Yet the latter observes the lightness and consoling nature of Schnittke’s writing too, the frisson of a live performance allowing for a classic statement of this work. Well, I’m not sure 'classic' is the word for the Walton. Puzzling, possibly. Let’s get to the puzzle in a moment. This is a more drawn-out performance than the one Bashmet was to give a dozen years later with Previn. Tonally the live set-up catches a grittier, terser tonal quality to Bashmet’s tone as well, though he gets the languorous breadth of the opening paragraphs. Invariably, though, the string bloom of Previn’s LSO is a continent away from the biting brass and sometimes glassy string mass of the Moscow orchestra. The finale is attractive for a live reading though there are ensemble imprecisions that may worry some. What will worry them a whole lot more - and what worries me and puzzles me (see above) - is what on earth went on in the scherzo. I’ve been wary of writing this review ever since I spent two hours trying to work out what’s going on. It lasts getting on for eight minutes – most performances take four or thereabouts – and Bashmet took 4:16 with Previn. In the dire long night of the critical soul that afflicts reviewers at three in the morning – moments when one realises that it’s not Alan Boult, it’s Adrian, and is it too late to correct it – reviewers sometimes also feel that they’re missing something staring them in the face. In that spirit, I admit this; I can’t hear a faulty edit, and can’t hear a mis-tracking. I really don’t want to think that soloist and conductor concocted an ‘elaboration’ of the material in this movement to balance the outer ones. Is that possible? So, let me, for the only time in the 14 years I’ve been writing here, turn it over to you. At the time of writing someone – and it’s not me - has uploaded just the scherzo onto YouTube. Maybe they’ve had the same thought. Take a listen and tell me what I’m missing. Until then, I can’t give this disc a recommendation and conclusions must be provisional.